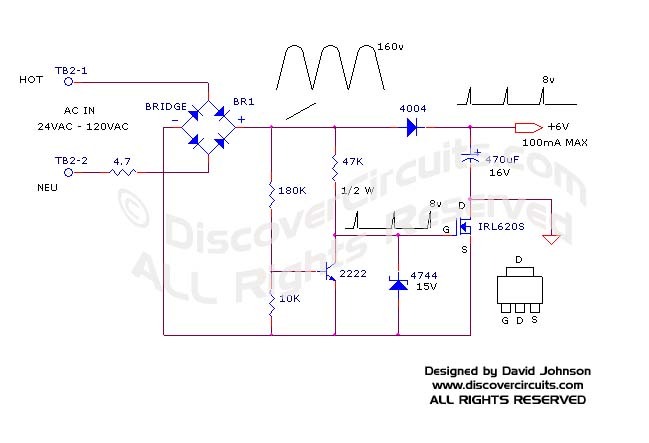 Circuit Solutions: Non-Isolated Off-Line AC to DC Power Supply by David Johnson P.E. Is it possible to design a circuit that can efficiently produce say 6 volts at a couple watts, without the use of a transformer or switching regulator? The circuit would not have to be isolated from the power line. Also, can the circuit be designed to fit inside a one square inch circuit board area? The design below does indeed fit within a one square inch circuit board area. It can be used over a wide 24vac – 120vac input voltage. The circuit gates only small slivers of the rectified AC signal to a 470uF energy storage capacitor. The 180K and the 10K resistors define the peak voltage fed to the capacitor. Other resistor values can be used to shift the DC output voltage up or down. Remember, this circuit should only be used with DC circuits that can be connected directly to the power line. Dangerous voltages exist everywhere.